There is a significant need for a comprehensive book addressing the operational and day-to-day security management requirements. IM, used in enterprise networks can easily be reconfigured and allow for potentially nonstop exposure; they require the level of security be scrutinized carefully. This includes inherent security flaws in various network architectures that result in additional risks to otherwise secure converged networks. A few books cover components of the architecture, design, theory, issues, challenges, and recommended policies for IM security, but none of them address IM issues in a manner that is useful for the day-to-day operations and management of enterprise networks. IM Security is intended to bridge this gap. There are no current books that cover components of the architecture, design, theory, issues, challenges, and recommended policies for IM security. 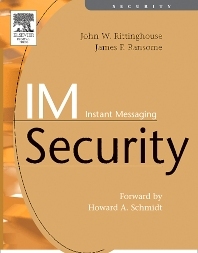 No book we know of addresses IM security in a manner useful for day-to-day operations and management of IM-capable networks in today’s corporate environment.